While not considered essential, adding one of the best pre-shave oils to your shaving routine can really help soften the hairs and provide an additional barrier between your skin and the razor to help produce a smoother, irritation free shave. Not all pre-shave oils are created equal and that is why we tested extensively every worthy pre-shave oil on the market to find the best ones for every skin type and need. We also have provided you with some great alternatives to pre-shave oils, as well as all the essential information you need to know about pre-shave oils including how to properly use it. What is in a Pre-Shave Oil? Art of Shaving is one of the biggest names in men’s shaving and grooming products, producing a vast range of popular products that many men swear by. They even made the top of our list for the best aftershave balms. Based on our testing and the plethora of positive reviews out there, this pre-shave oil had to take the overall top spot. This pre-shave oil is available in either an unscented version or several different choices of scents, including Sandalwood, Lemon, and Lavender. Not only did the Art of Shaving Pre Shave Oil was extremely useful, but we have to say that the Sandalwood fragrance was incredibly nice and almost worth it for that alone. 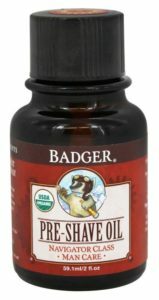 100% natural and all-organic, there is no doubt that this incredible product from Badger is at the top of the class. This is by far the best all-natural pre-shave oil and in fact, there’s every bit a chance we would have ranked this product number one. However, like some of the other pre-shave oils, the smell of this product may take some getting used to or may not be for everyone. Still, if you’re looking for something that’s organic and free from harsh chemicals, while still getting the job done, look no further than Badger. Badger has a great line of male grooming products. They also made our list of the best beard oils and best lip balms for men. We really couldn’t decide between the American Crew product and Taylor of Old Bond Street’s amazing Sandalwood Pre-Shave Oil. While some find the scent of this product to be a bit overpowering, we find it to be just the perfect amount, as it soon fades away after shaving. As far as performance goes, you won’t find a much better product, which isn’t surprising since Taylor of Old Bond Street is one of the top names in the barber business. It may be a bit more expensive, but it’s well worth the price, especially because the bottle should last for months as you only need a few drops at a time. Taylor of Old Bond Street’s Sandalwood shaving cream also made the cut for the best shaving creams and best shaving soaps as well. Pairing both their pre-shave oil and one of their shaving creams or soaps is a great combo. For people with sensitive skin, you’ll probably want to stay away from most traditional pre-shave oils, but this one was specifically designed for people with particularly sensitive skin in mind. It is paraben-free and contains no artificial fragrances or colors. This natural product is 100% hypoallergenic, making it perfect for even the most sensitive skin. Those of you that have seen this product on sale in your local Wal-Mart might be laughing that we’ve included in on the list. In truth, it’s probably the only product on our list that you can easily find at any local store and it’s the cheapest product on our list—but the price is one of the reasons it’s on here. Shave Secret is a blend of natural oils and essential oils, with just a hint of soothing menthol. Since using pre-shave oil isn’t for all men, if you’d like to give it a try without spending too much cash, Shave Secret is a good option. If you don’t have extra sensitive skin or any special needs, you’ll probably be ok with using most any pre-shave oil you come across. However, considering the quality and the price, you definitely can’t go wrong with the fantastic shaving oil from American Crew. Featuring eucalyptus, clove, peppermint and a number of other natural essential oils, this antibacterial oil can help prevent irritation and also ingrown hair and razor bumps. Plus, it’s one of the cheaper high-quality oils you’ll find. Another one of the best pre-shave oils for those with sensitive skin is Dermalogica Close Shave, which is also hypoallergenic. In truth though, we didn’t think it was on par with the rest that we tested, but many gave it positive reviews, so we figured we had to include it on the list. 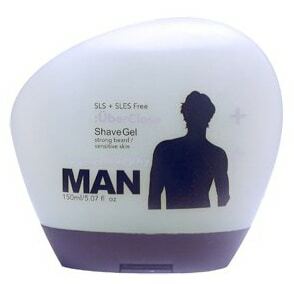 Anthony Logistics also produces one of the best shaving gels and best shaving cream for sensitive skin as well. Proraso has been a staple for Italian barbers for decades, but only recently has the rest of the world begun to catch on to the secret. Featuring menthol and eucalyptus, this product not only gives a smoother shave but also helps to cool and soothe the skin once you’re finished. Not only that, the strong fragrance is sure to clear your sinuses along the way. This is a product that’s not technically an oil, but as it’s still used in the same way, it provides incredible results, and is excellent for sensitive skin! Just look at the raving user reviews on Amazon. 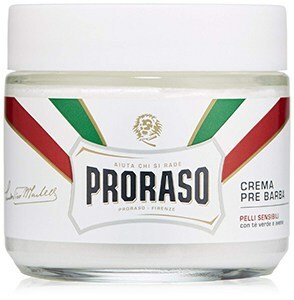 When using Proraso, rub a tiny amount of the cream onto your wet skin immediately before applying shaving cream or soap. You’ll not only get a fantastic cooling and tingling sensation on your face, but also a much better shave. They also made our list of the best aftershaves for men as well. Another product that uses all natural and organic ingredients, Über Close is also suitable for vegans, which is partly why we’ve decided it deserves a mention. However, the real reason we’ve included it is that it’s more like a combination of pre-shave oil and shaving cream in one. While all of the other products are designed to be used in conjunction with shaving cream or soap, Über Close is a transparent gel that you rub directly into your facial hair, let sit for a few seconds and then start shaving like normal. You’ll be pleasantly surprised at how smooth and painless of a shave this product can provide, and it may even convince you to ditch the shaving creams for good. Current Price Here at Wm. Neumann & Co. This is another product that is easily good enough to make it into the overall list of the best shaving oils, but we’ve decided to include it in the non-traditional category for the fact that it is much thinner than any of the other oils we tested. If you’re one of the men who find shaving oils to clog up your razor too frequently, we highly recommend giving this product a try. Similarly, many straight razor shavers dislike oils because they’re too hard to wash off the blade in between strokes, but the thinness of this product helps eliminate that issue as well. Featuring a very masculine scent, with numerous woody and citrus fragrances, this pre-shave oil is sure not to disappoint. While it may seem a little silly, another thing we loved about this product is the lid. While many products have lids that full screw off, making it easy to pour out too much, the cap on this bottle only unscrews part of the way, making it much easier to control how much you’re pouring out to ensure there’s no waste. When it comes to getting the closest, smoothest shave possible, many men swear by using one of the best pre-shave oils. For those of you that have never tried a shaving oil before, the purpose of these products is to help soften up your facial hair before you shave and also to lubricate your skin to allow the razor (best safety razor) to gently glide across your face. This not only can result in a closer shave, but it can also help to reduce the amount of irritation your skin feels post-shave, as long as you choose one of the best shaving oils or else otherwise you may end up a greasy mess. The one bad thing about many pre-shave oils is that they do tend to clog up the razor, so you’ll likely need to rinse your blade off much more than usual. However, that is only a minor inconvenience compared to the quality of the shave you’ll get with high-quality pre-shave oil. That being said, there are hundreds, if not thousands of shaving oils on the market, and they’re not all created equal. So, to make things a bit easier for you, we’ve tested many of the top brands and products on the market to help you find the best pre-shave oils. They, of course, won’t all be the same, but there are often some common ingredients. 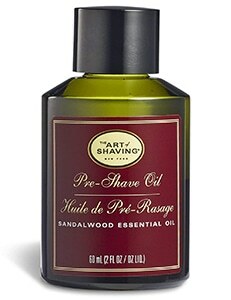 The ones you’re going to find on our list of best pre-shave oils will generally have many natural oils. These are low on the ‘grease factor’. You’ll find the oils from sunflowers, coconut, and olives which won’t clog your pores. Other ingredients are going to be the likes of vitamin A and E, peanut oil and sweet almond oil. Obviously, this isn’t an exhaustive list. But a careful blend will create a great working oil and one which will smell incredible. If you think you’re not getting much for your money when you buy one of the best pre-shave oils, think again. You use so little each time, you’ll have your bottle for many, many months. Just follow these simple 4 steps and enjoy new and improved shave routine! #1 Put just a few drops into the palm of your hand. #2 Rub your hands together and then massage the oil in the beard bristles. Do this for at least 30 seconds. #3 You should then leave the oil to do its thing before you start shaving. Don’t touch it for at least another 30 seconds. #4 You’ll then need to wash the oil from your hand. Not doing so will give you a loose grip on your razor which is something you’ll want full control of! It’s all in all just a little bit of extra ‘work’ before your shave which is going to give you a more comfortable, smoother shave and give your skin an added layer of protection from your chosen shaving method. In truth, there are so many good pre-shave products out there, that trying to narrow it down to a list of the best pre-shave oils was quite tricky and we had to leave many deserving products out. So, if you’re willing to do some experimentation and try out different products on your own, you may quickly come across something that works much better for you than anything we’ve already mentioned. 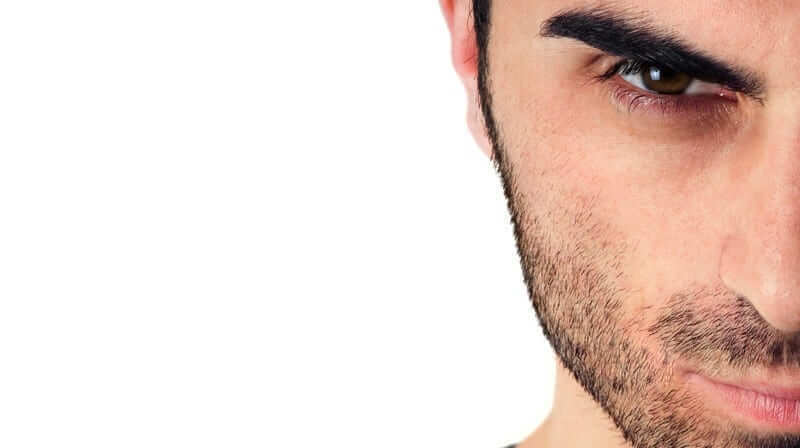 Moreover, every man’s face is different, and not everyone wants the same thing in their pre-shave products, meaning it’s a matter of personal choice. Still, if you’re looking for a quality product, you cannot go wrong with one of the products we’ve covered here, all of which should help give you a closer shave with less irritation. Alternatively, you could always try to make your own pre-shave oil. How to Lather Shaving Cream with a Brush! Let’s Break Down the Steps! I’m 86 years young, a this is the first I ever heard of pre shave oil. I’ve used the Proraso pre-shave cream and I found it great for softening up the stubble before lathering up with cream/soap. Excellent product and super cool feeling on the skin! Curious if you guys tested the Barberry Coast pre-shave oil as another all natural alternative. I got their aftershave on your recommendation and love it. Will actually be ordering another bottle soon. Same would go for their aftershave balm actually (since I can sometimes struggle with dry skin I’m considering having some on hand for the times when I would need it). Shave Secret is the only shaving oil that I’ve tried so far. I use it as a pre-shave, underneath shaving cream, but the package states that it can be used stand alone. I haven’t tried that. It is light, and doesn’t clog my razor. Shave Secret is a great option! I guess as they say, if it works, don’t try to fix it. But I guess its up to you. But I guess if you have only tried one, you don’t really have anything to compare it to.